Chrysoberyl is among the most brilliant of gems and its hardness is only surpassed by diamonds and corundum. The name chrysoberyl derives from the Greek, meaning "Golden Beryl", although in reality, it is not a variety of beryl at all. Chrysoberyl is a berylium aluminum oxide, whereas, the mineral beryl is a silicate. The crysoberyl family includes some of the most valuable and desirable gems like alexandrite and chrysoberyl cat's eye. Chrysoberyl most commonly occurs in transparent tones of yellow and green. Cat's eye has the longest history of gems in the chrysoberyl family. It was treasured in Asia before the birth of Christ and became quite well known in Rome by the end of the First Century. In the symbolic necklace of Vishnu, a green cat-eye chrysoberyl represented the magnetic center of human passion. The popularity of Cat's Eyes sky-rocked in the 19th Century after the Duke of Connaught presented his fiance with a cat's eye betrothal ring. Ceylon, where most of the examples of cat's eye were mined could not keep up with the overwhelming demand. Alexandrite, the chameleon like variety of chrysoberyl, was discovered in an emerald mine in the Ural Mountains in 1830 on the birthday of Czar Alexander II, after whom the gem was named. The most common varieties of chrysoberyl occur in shades of transparent greenish yellow. They are found predominately in Brazil and Sri Lanka. This variety was imported into Europe where it became very popular in Victorian and Edwardian jewels. Chrysoberyl has been attributed with great power. It has been used to balance energies and foster meditation. 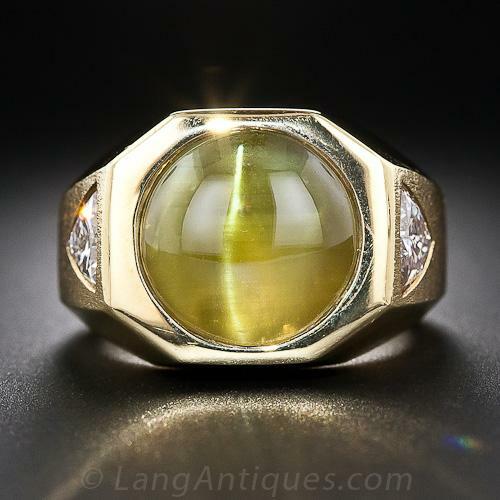 Chrysoberyl has long been thought to aid with problems of the eyes and protect against the "evil" eye. It fosters improved relationships with your neighbors. In Arabic tradition, it’s believed that the chrysoberyl could make the wearer invisible in battle. Similar Stones: Chrysoberyl cat's eyes can be confused with varieties of chatoyant quartz and fine tourmaline. The name Cat's-eye applies only to chatoyant chrysoberyl. In recent years, a good glass imitation of cat's eye has been developed, called Cathaystone.